Alexander was the pupil of the storied Greek philosopher Aristotle. He was intelligent, quick to learn and extremely well read. His personality defined charisma and his obsession with success allowed him to conquer most of the world at the time. He left a significant legacy beyond his conquests as he founded some twenty cities that bore his name. Under his rule, Greek culture spread from West to East as the Persian Empire fell to his armies. Alexander became an icon, against which all future military leaders would aspire to be measured. Even today, military academies throughout the world still teach his strategies and tactics. 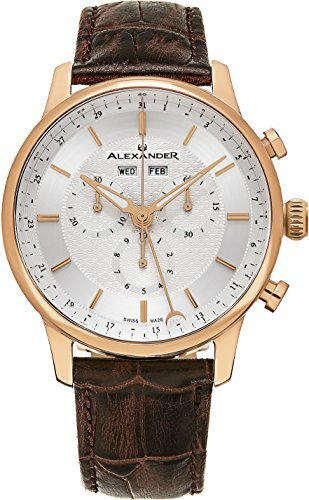 It is against the backdrop of the historical Alexander the Great, his achievements and strength of character, that the Alexander watch brand was born. Alexander timepieces exude character, resiliency, and enduring magnetism, much like their namesake. Supreme confidence surrounds the wearer as these timepieces accompany her on daily journeys. These timepieces incorporate the best in watchmaking heritage with modern day technology and contemporary aesthetic sensibilities. They stay true to tradition, yet are fitted with an added dimension of prevailing design and chic personality. Constructed with a signature demeanor, they are a bold statement in the world of wristwatch fashion. Alexander manufactures its luxury wristwatches in Biel, Switzerland. The ancient town of Biel/Bienne, the metropolis of Swiss watchmaking, lies at the eastern end of Lake Biel, at the foot of the Jura in the delightful Lake Region of Switzerland in the canton of Bern. It is here where the Swiss craft of watchmaking is still fostered and advanced. The Alexander blueprint stresses quality workmanship and contemporary aesthetics. We take pride in our ongoing quest to continuously design, develop, manufacture and assemble exquisite timepieces.